I have just recieved a full batch of stickers and they're quite nice. I'm giving these out to members for free so pm me or post in this thread if you would like one! I just made an order myself for 5 stickers - I'll update this thread when they arrive and if anyone in the area wants one they can stop by and pick one up no charge (limited supply)..
im up for a sticker. more people out on the trails the better! Hey guys, got the first 5 stickers in - I'm keeping two for my two trucks, but I've got 3 more here for whoever wants them. You can also order them off the link above. ill grab one wenever u got a chance. only downside is the samurai is under construction once again... going for spoa this time.a sticker would be a good touch to a renovated rig. If its not too late I'd be happy to swing by an grab a sticker from ya. I've got two left here for whoever comes first - pm me for my address (north cowichan/duncan). I'm going to put in another order as well and I'll come up next time there's a nanaimo run and hand them out! Maybe try straight white text on a black background? simple, but should be readable. I'd throw one on my truck. You definitely won't be able to read anything dark on my truck, it's black and the canopy is tinted. That's my plan - I've got two new designs made up, one all white, and one with a thick white outline and red background. I'm just waiting to get some test runs printed up and if all goes well I'll get a big batch made. When they're available I'll be giving them out free of charge for anyone interested! I just got a few new tester stickers in. A big thanks to Glen (ToyZuki here on the forum) for offering his services at a great cost! These new stickers are proper cutout vinyl and they look great. Here are some pictures of them on my 4runners. I'll be getting a bunch of these made up and they will be free to anyone who wants them. I'll post again when the full batch is ready. Alternate sizing will be available too. Those do look good, glad you like them. I'll get on cutting the rest as soon as I can. those look pretty wiked. id like to have one or 2 for my rig. I wanna go for a run soon too... too bad I have no time..
Hey everyone - the full batch of stickers just came in. I've got lots to go around so anyone who wants one just post here or pm me! I'm up for a sticker or two. Where can I pick up. I need dis. This weekend I'm in town, I'll throw you a text maybe I can swing by. Thanks for the stickers Shane. Good touch to the newly modified samurai! You're welcome guys - lots left here for anyone else that wants one! We'd love one - here in Duncan! Hey guys pm me for a bumper sticker - they can be picked up at my place in north cowichan/duncan. Still many available! I'd love one too, if there are any left! Im in Chemainus so I head through Duncan quite often. 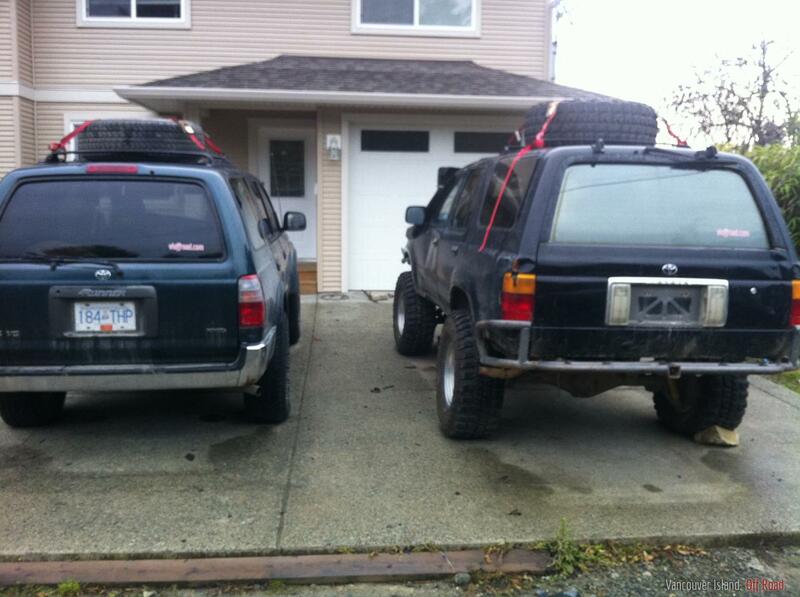 Too weird, I checked out a 4runner the other day on my route. I thought it was pretty cool, and I noticed the vioffroad.com sticker. I'm thinking it was you! Looks like you were right Glyn. Good meeting you today! If you have anymore stickers kicking around I would Like 1-2 of them for my Jeep. Still have more if anyone else wants some! Absolutely. Would love to have a couple stickers for my rig. I was following behind Welshy on the weekend with my eye on his!! Welcome to the site Hailey! I've still got a number of stickers - I'll pm you to make arrangements. We're completely out of the medium sized stickers, but I do have a few large ones left (~1ft) and a number of the smaller ones (4 inches). I'm looking into getting more mediums made but for now if anyone wants a big or small one let me know! Dave I'll pm you to confirm. I could go for one. Size don't matter. hey dave so you headed up and gona try to attempt the lake this weekend? congratz on getting truck ready to go! I need one of these! got mine this weekend thanks man! Hey guys, I know a few of you are still waiting on a sticker - I'm getting a few samples made before I print another big batch, but it should be soon. I've been having a hard time finding the same style of individual cutout letters as before, and it's looking like it's going to be pricey for another batch (got a great deal last time from a forum member). I'll probably have to start selling them for a few bucks going forward, but for those of you who have already asked me you'll still get yours free. I'll post an update when more come in and pm anyone on the waiting list! 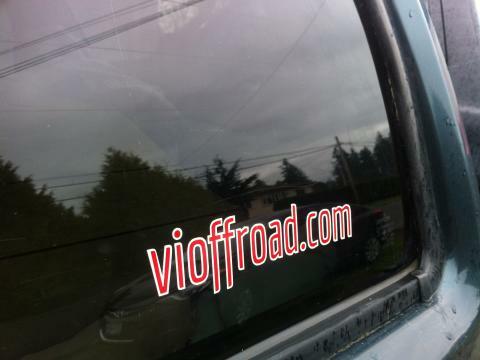 Hey on the topic of rep'ing the site, is there any interest in vioffroad gear (tshirt, hat, tuque, etc)? Definitely wouldn't be able to give that stuff away for free but if anyone was into it I could get a bunch made up and sell them at cost. Anyone interested let me know and if we get a good response I'll look at options and put together some prices. I wouldn't mind a nice vioffroad profit hat myself. 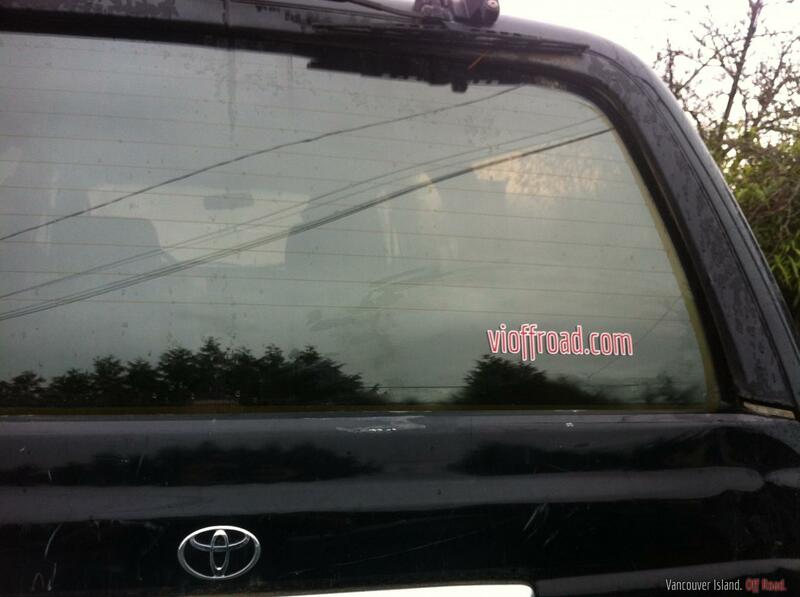 hey jay i have 2 extra VIOFFROAD stickers in my truck, im near uptown in Victoria if your interested. they arent the nicest looking ones ( a bit dirty) but i think thats just the part you remove anyways. let me know! and yea shane makes sense to pay a few bucks for em, i think thats fair! Im in Lnagford as well, i would take one or two. want to meet later today? I'd buy one of each if they are good quality. Pretty good quality. Just power washed my jeep. Sticker stayed on no problem. If there are any in the Sooke area I'd grab one, my X is bare! I'd take a couple as well. I would love a couple stickers. I don't mind paying if they can be shipped to port alberni. Just pm me how much. (If that's possible) thanks. Ok guys sorry for the huge delay - it took me a while to find another sticker supplier but I finally did and I've got a fresh batch in my hands now! Lots of you have asked for stickers so I'll try not to miss anyone but if you'd like one please pm me your address and I'll stick one in the mail! Got mine in the mail today, thanks! I see these are larger than the ones I have. So.....how do I get them? Got mine in the mail today. thanks Shane. Mine arrived today. Thank you very much Shane. got mine the other day! thanks! No problem guys! I think I got everyone but if I missed anyone let me know. Sticker coming your way James, welcome to the site! I'll send you a new one for your new window - you at the same address?